Akcay where is the first tourism resort of Turkey, in Edremit Balikesir city. After 1980’s it has increased in tourism. Because of near to İstanbul, the town has been preffered officeholders. After 1990’s, there were so many developments about tourism. Akcay that is the most popular holiday resort of Edremit Gulf, is known as ‘Water Town’. Town which is located on Kazdagi mountain foot, has many places that must seen. Sutuven waterfall, Hasan Boguldu lake, Sahinderesi canyon, Mihli watercourse..are must seen places in Akcay. Moreover, there is world-famous Antandros antic city. Symbol of Kazdagi mountain is Sarikiz sculpture, in the centre of town. There are so many rumors about Sarikiz legendary. There is Sarikiz festival every year in town. It attracts so many people in every single year. Akcay is a must seen holiday resort with its natural beauties and historical buildings. It is able to enjoy sea and have fun other activities in town. Blue cruise which offers travellers enjoy sea and see naturel beauties at the same, is very popular recent years. 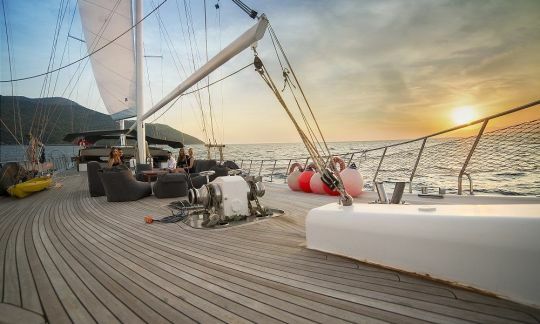 It is able to have holiday pleasure and discover new things with your loved ones by chartering your luxury yacht. 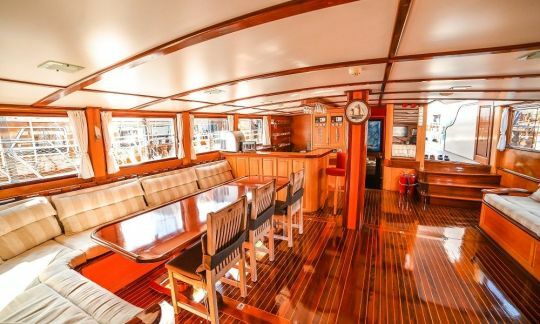 It is able to see beautiful coves while you are having fun at sea. If you are thinking of blue cruise in your summer holiday, you should decide your chartering yacht. First of all, charter company must be professional and expert. Your charter yacht also must be suitable for your budget and pleasure and give response all your request and demands. Charter yachts must been renewed regularly beacuse of your safety during the blue cruise. Blue cruises are very popular in our country Turkey, that is surrounded by sea from three sides. Mediterranean and Aegean sea coves are most attracting places for blue cruises. In recent years Greek islands have been added in these cruises. Different cultures,different flavours always attract us. Bodrum ranks among the top in blue cruise tours. We can say that Bodrum is the heart of blue cruise.Bodrum hosts many local and foreign visitors everyear by its cultural structure and nature. Bodrum blue cruise tours are much ideal for swimming and sunbathing.Moreover you can discover the coves that you encamp by your rental yacht.You can blow off steam by different water sports.There is a light breeze which pleases you greatly in Bodrum.When sound of waves are added in that light breeze,your holiday becomes more enjoyable. Turkyacht organizes blue cruise tour programmes for Bodrum lovers.It has been trying to present an awesome blue cruise tour by its smiling staff and luxury boats.You can look over boats and tour programmes on our website. You can witness all shades of green and blue by visiting the coves in blue cruises.You can discover new sights in every trip and also immortalize them with your camera.In recent years blue cruises are one of the most preferred holiday choices among many local and foreign tourists. You find chance to have a comfortable holiday as you feel in a otel,by rental schooner(gulet).If your trip to a cove or Mediterranean and Aegean sea or Greek Islands,wherever you want.You can find a chance for a great holiday. Rhodes (Rhodos or Rodos in Greek), lies between Crete and the near East in the Aegean ocean. Rhodes is the biggest of the Dodecanese islands. Named the sun island or island of light there are hardly any days when the sun doesn’t shine. With its subtropical climate and over 3.000 hours of sun per year you can be guaranteed a good tan on your holiday. Rhodes is one of the most popular holiday islands in Greece even Greeks themselves come to Rhodes for a holiday from the mainland. Dinner and overnight stay at Rhodes Island. We will cruise to Symi Island early in the morning. 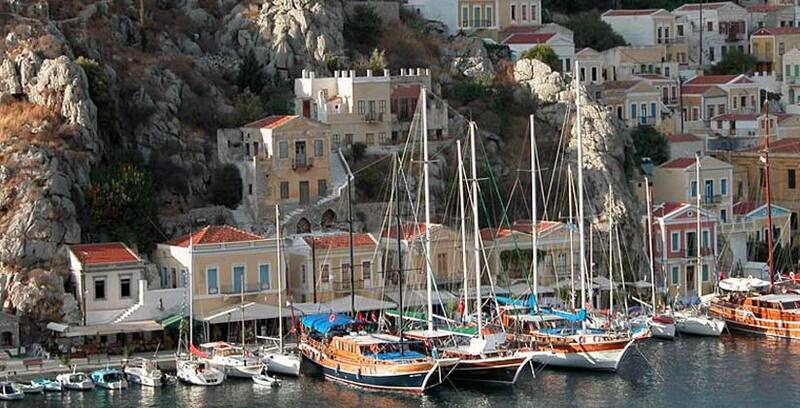 Symi has the most beautiful harbour in Greece. On either side of a steep sided fjord rise tier upon tier of houses, some white, some pastel yellow, but virtually all with Neo Classical pediments a reminder that 100 years ago this was one of Greece’s most prosperous islands. There has been virtually no modern concrete construction here and now these fine old houses are being resurrected for visitors. The spirit of the island remains intact. Dinner and overnight stay at Symi Island. We will cruise to Tilos Island early in the morning. Simple, polite people welcome you as soon as you arrive on the island of Tilos. Tilos island has only 300 inhabitants and very little tourism. Here you will enjoy a quiet life, nature and you will swim in crystal clear waters. The lack of tourism gives you the opportunity to really get to know the locals and become part of their every day life. Don’t forget to visit Megalo Chorio where surrounding the central plaza you will see the remains of ancient walls, a necropolis (cemetery), a museum, monasteries and the ruins of a castle. Nissiros or Nisyros, a small island in the middle of the Dodecanese complex, has lots of natural beauties and a rich cultural heritage whose inhabitants maintain alive up to day. The geomorphologic feature most characteristic of the island is its volcano. It is said that Nisyros was born after a series of successive eruptions of the volcano, which is unique of its kind in Greece. The volcano of Nissiros island is considered to be still active and because of the easy access to its craters, thousands of tourists and scientists from all over the world visit it every year. The volcano and the serenity that one experiences in the picturesque villages of Nissiros island are two of its main attractions that will truly captivate you. Lastly, the island has a very rich fauna and flora that specialists have pronounced to be unique. Dinner and overnight stay at Nisiros Island. Gyali is a small island situated 2 n.m NW from Nisyros Island; its SW part consists of thick layers of pumice stone, while its NE part consists of obsidian currents and perlite. In the island there is a pumice stone mining plant. Aghios Antonios islet is in a very close distance and has a beautiful beach. 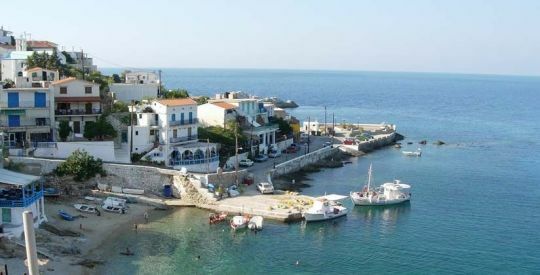 Then we will cruise to Kos Island. Kos Island is really well worth visiting. Kos is the island that gave the world Hippocrates, the father of medicine. The third largest island of the Dodecanese, it is a very green island with an excellent infrastructure and large roads lined up with palm trees. During your visit to Kos Island, you must certainly visit the ancient ruins of the city that are numerous and remarkable, the ruins of ‘Asklipios”, the ‘Castle of the Knights’and the huge tree of Hippocrates (trunk diameter is 11,5 meters!). On Kos you will find some of the finest beaches in the Dodecanese islands of Greece. With many archaeological sites in and around the town, Kos is the ideal place for walking or cycling. Dinner and overnight stay at Kos Island. We will cruise to Kalimnos Island early in the morning. Kalimnos is best known as the island of some of the world’s finest sponge divers. Although Kalimnos is a developing tourist centre, you can still see the sponge fishermen at work even today and you can still experience the islanders’ traditional way of life. On this beautiful island of Kalimnos in the Dodecanese, you can take nice walks, swim in beautiful caves, and discover lovely beaches and unspoiled scenery, an example of which is the authentic village of Vathi hidden in a beautiful green valley. Due to its mountainous landscape, Kalymnos is also one of the best places to practice mountain climbing! Also, most of the beaches of Kalymnos are equipped with water sport facilities. The wonderful sunsets over the tiny island Telendos are not to be missed they are on par with those of Santorini! Dinner and overnight stay at Kalimnos Island. We will cruise to Pserimos Island early in the morning. Pserimos is an islet located between Kos and Kalymnos, about six nautical miles north of Kos and close to the Turkish coast. The total area is only about 15sq km and there is only a handful of permanent residents, around 100 who rely on fishing and tourism. The island is a popular destination for tourists who arrive from Kos or Kalymnos on small excursion boats or pirate type tourist ships that arrive daily throughout the summer. Pserimos is a good day out for those wishing to avoid organised beaches of Kos or Kalymnos but the beach, though large, can get crowded once all the day trip boats arrive. The beach is wide, deep, very sandy with shallow waters well sheltered in the deep bay and lined with beachside tavernas and cafes that catch the daily trade. There is a small harbour for boat mooring. There’s not much to see beside the single sandy beach though tracks lead over the rocky treeless hills to small coves. Then we will cruise to back to Turkey via Turgutreis. We will have a swimming stop at Karaincir on the way back to Bodrum. Karaincir is a 500 metre stretch of soft golden sand which is great for all the family. The tranquil blue water is invitingly calm, and also offers a number of watersports from banana boats to pedaloes. You can also soak up the relaxed ambience around the beach from one of the many sun loungers made available, whilst sipping on a refreshing drink from one of the venders. Bodrum is the ideal starting point for sailing the Aegean coast of Turkey. The Gokova Gulf is acknowledged to be one of the best cruising areas in Europe. With abundant sunshine, crystal clear waters, continuous blue skies, good anchorages and friendly people, this coast offers many diversities. There are many unspoiled areas rich in natural beauty and in costal settlements and villages. After breakfast we will set sail to Palamutbuku. Palamutbuku is reputed for having the best beaches in the Datca peninsula. The beaches are small but very beautiful. Surrounded by mountains and spotted with gardens, these beaches are known for their tranquility and fresh sea air that together present the perfect backdrop for a rejuvenating getaway. Palamutbuku is located at the end of the peninsula and is also famed for the remains of the historic city ofKnidos. Knidos, known for its bounty of fish, is located about 12 kilometers away. The waters here are crystal clear, so much so that it is believed that if you take a needle at the very bottom of the sea, you can still see it! The people are warm and friendly. Palamutbuku epitomizes peace, tranquility and happiness. With its warm people with their smiling faces and immense natural beauty, Palamutbuku is indeed a little paradise in its own right.We will anchor at Ince Burun after lunch and swimming breaks. We will stay in this lovely bay for dinner and an overnight stay. After breakfast we will cruise to Aktur Bay. Witness the world’s oxygen tank at Aktur! Spotted with pine trees, it definitely is a slice of paradise. In fact, it won the title of the ‘most beautiful bay inTurkey’ and proved to be a hot tourist destination. Aktur consists of two units, namely Datca and Kurucabuk, located at a distance of 4 km from each other. The Hisaronu bay is located very close to the narrowest strip of the Datca peninsula and separates the Gulf of Gokova from the Gulf of Hisaronu. Around 550 BC, it served as a defense line against the Persian army who wanted to capture both HisaronuGulfand the GokovaGulfby digging kilometer long tunnel. Being a small island between the two gulfs, it definitely made a good point of defense. However, although the work was started with great effort, the city was ultimately conquered by the Persians. The bays of theGulf ofHisaronu can be reached by a yacht from Bencik. The Borbudet Cove can be accessed by a 20 minute walk from the harbor entrance at Bencik. Bencik Bay which has a very narrow entrance but a unique view once you get inside. Bencik is located at the narrowest part of the peninsula that divides Hisaronu Gulf from the Gokova Gulf but it is located at Hisaronu side. Dinner and an overnight stay will be in Bencik Bay. After breakfast, we will anchor in Emel Sayin Bay and you can enjoy a swimming stop in this lovely bay. Named after the “queen and ambassador of Turkish classical music”, Emel Sayin, this place is indeed a great economic holiday destination with its mesmerizing smell of the pine trees, clear sea coast, awe inspiring views of the bays and warm and welcoming people. The Selimiye village in the Mugla district of Marmaris is one of the pearls of the Gulf of Hisaronu. The ancient name of this village was Hydas, which got changed to Losta. At sunset, the sun disappearing behind the mountains surrounding the village seems to dye the scenery in a rich red hue. The ancient site of Bybossos Hydas (Selimiye) has ruins dating back to the archaic period. One of the highest hills of the region is in Selimiye, the other one at the top of Sarikaya and the last one has three castle ruins, including the Kizilkoy Asarkale Quarter. The sheep shaped southeastern hills are visited by foreign tourists looking to explore the castle ruins dating back to the Hellenistic era. The tomb in the southern part of the square is located 100 meters offshore from the coast and shows ships the way to the Selimiye. Other areas of interest include a monitoring tower, a lighthouse, a monastery and a theater. After breakfast, we will anchor in Dirsekbuku. Dirsekbuku is located between the Gulf in the Aegean Sea and the Gulf of Hisaronu. There are many tourists travelling from Bodrum to Marmaris who stop here for rest, which is whey this region is replete with several sheltered bays. In addition, Dirsekbuku offers a great cruising experience, especially if you are exiting the different islands and sailing around Hisaronu in the morning. Boarding starts at 15:30 from Bodrum Harbour. On the first day, our gulet will remain anchored in Bodrum Port for dinner and stay at the port an overnight. Bodrum is a port city in Mugla Province, in the south western Aegean Region of Turkey. It is located on the southern coast of Bodrum Peninsula, at a point that checks the entry into the Gulf of Gokova. The city was called Halicarnassus of Caria in ancient times and was famous for housing the Mausoleum of Mausolus, one of the Seven Wonders of the Ancient World. Bodrum Castle, built by the Crusaders in the 15th century, overlooks the harbour and the marina. The castle grounds include a Museum of Underwater Archeology and hosts several cultural festivals throughout the year. After breakfast, you will be informed about the cruise itinerary and the gulet. Then we will cruise to Ada Bogazi. Adabogazi derives its name from the word ‘Aquarium’ simply because the water here is so clear. You can see as deep as 30m with the naked eye! There are small bays at the west end of the west end and together with the crystal clear waters, present a perfect feast to the senses. You can reach Adabogazi on a yacht or a boat trip and swim up to 20m in gleaming waters. Dinner and overnight stay at Mersincik Bay. After breakfast, we will anchor in Knidos. Knidos is one of the most magnificent ancient cities inAnatoliathat you should visit. As the first settlement in the east of the Datca peninsula, Knidos has splendid ruins and a unique beauty. There is a theater is located right next to the harbor of the ancient city ofKnidos. A short walk towards the harbor will take you to the remains of two churches built during the Byzantine period. Knidos century has been a site of archaeological excavations since 1960. The Statue of Demeter discovered here and the lion statues that protected the harbor in ancient times now adorn the halls of theBritishMuseum. The sacred temple of the goddess Aphrodite is a major center of attraction. The city with a huge necropolis, a double harbor and the magnificent acropolis with the temple of Aphrodite truly impresses all visitors. Then we will cruise to Aktur Bay. Witness the world’s oxygen tank at Aktur! Spotted with pine trees, it definitely is a slice of paradise. In fact, it won the title of the ‘most beautiful bay inTurkey’ and proved to be a hot tourist destination. Aktur consists of two units, namely Datca and Kurucabuk, located at a distance of 4 km from each other. Dinner and overnight stay at Aktur Bay. After breakfast, we will anchor in Selimiye Bay.The Selimiye village in the Mugla district of Marmaris is one of the pearls of the Gulf of Hisaronu. The ancient name of this village was Hydas, which got changed to Losta. At sunset, the sun disappearing behind the mountains surrounding the village seems to dye the scenery in a rich red hue. The ancient site of Bybossos Hydas (Selimiye) has ruins dating back to the archaic period. One of the highest hills of the region is in Selimiye, the other one at the top of Sarikaya and the last one has three castle ruins, including the Kzlkoy Asarkale Quarter. The sheep-shaped southeastern hills are visited by foreign tourists looking to explore the castle ruins dating back to the Hellenistic era. The tomb in the southern part of the square is located 100 meters offshore from the coast and shows ships the way to the Selimiye. Other areas of interest include a monitoring tower, a lighthouse, a monastery and a theater. American underwater archeologists and scientists are engaged in researching sunken wrecks in the region and have produced valuable findings that are now exhibited in the Bodrum Underwater Museum. Selimiye is frequented by the Blue Cruise boats. Selimiye – Hisaronu – Orhaniye are like an indispensable trio. Selmiye is also renowned for its clean sea water, a great bounty of fish, vegetables, fruits, almond and olive trees, the smell of fresh thyme and oregano enveloping the mountains, clean, pollution-free air, peaceful environment and warm people. Afterwards we will cruise to Orhaniye Bay. Featuring its deep blue sea and the legendary Kizkumu beach, Orhaniye is well admired by all holidaymakers. Take a journey down its quaint village roads to discover the historic castle of the black knight. Floating in this bay, the yachts present a picturesque scene. ThevillageofOrhaniyehas lots to offer to a hungry tourist. Enjoy walking down the village or witness the beauty of the busy docks accessed by local and foreign yachtsmen alike, stay indoors or explore the local culture and cuisine of the place – Orhaniye is full of surprises! 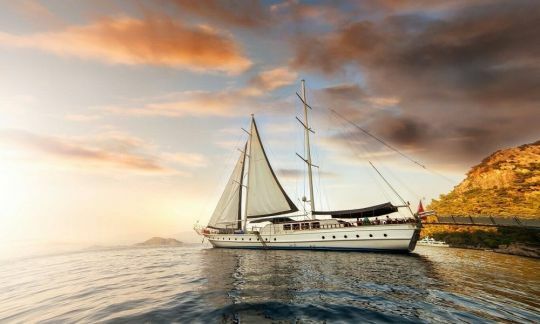 Then our gulet will sail to Bozburun for dinner and spend the night there. After port formalities we will set sail to Symi Island . Symi has the most beautiful harbour in Greece. On either side of a steep-sided fjord rise tier upon tier of houses, some white, some pastel yellow, but virtually all with Neo-Classical pediments – a reminder that 100 years ago this was one of Greece’s most prosperous islands. There has been virtually no modern concrete construction here and now these fine old houses are being resurrected for visitors. The spirit of the island remains intact. Dinner and overnight stay at Symi Island. We will back to Turkey via Datca. Datca was founded by the Dorians settled in the Aegean islands and the southern coast ofIonia. This peninsula is located between the Aegean Sea and theMediterranean Sea. At the end of the peninsula, at a distance of about 38 kms is the ancient Carian city ofKnidos, which was described by Strabo as the ‘city built for the most beautiful goddess, Aphrodite, on the most beautiful peninsula&quot;. It is also believed that around 500 years ago, the Spanish pirates sailing left leprosy patients to die here but the fair weather of the peninsula recovered the lepers! We will cruise to Palamut Buku for dinner and an overnight stay. Palamutbuku is reputed for having the best beaches in the Datca peninsula. The beaches are small but very beautiful. Surrounded by mountains and spotted with gardens, these beaches are known for their tranquility and fresh sea air that together present the perfect backdrop for a rejuvenating getaway. Palamutbuku is located at the end of the peninsula and is also famed for the remains of the historic city ofKnidos. Knidos, known for its bounty of fish, is located about 12 kilometers away. The waters here are crystal clear, so much so that it is believed that if you take a needle at the very bottom of the sea, you can still see it!The people are warm and friendly. Palamutbuku epitomizes peace, tranquility and happiness. With its warm people with their smiling faces and immense natural beauty, Palamutbuku is indeed a little paradise in its own right. After breakfast, we will be anchoring at Kisebuku (Alakisla Buku). Located only 3 miles away from Orak Island is Kise Buku, a name originating from the word ‘kilise’ (church) due to the remains of the Byzantine Monasteries found in this area. It is indispensable for all boats to anchor here at a very large cove. This bay is surrounded by mountains in the north, and western winds blow in the eastern side of the island against. At Alakisla, you will encounter the ruins of an old monastery by the name of Kise Bay. Kise’s name is also believed to originate from the word ‘church’. The must-visit places in the Kisebk ruins include Yalkoyu, Akarca, Fork, summerhouse, bath, cistern and the cove where the ruins of the church are found. These call for an indispensable stop during your Blue Cruise. In a few coves in the vicinity, you can find wonders like cold drinking water boiling! The silhouette of a grove of Oleander trees rolling down into the sea against the glittering sandy beaches is indeed a spectacle to behold! Then we will sail to Black Island. Karaada is located around 5 km away from Bodrum and is renowned for the immense healing power of its sulphurous waters and mud baths. The hot water and mud from the cave is believed to restore beauty and health. The hot water has a temperature of about 29-32 degrees and flows into the sea. Here you will have the opportunity of swimming in hot waters and take a mud bath. Then our boat will cruise back to Bodrum Port for the last day’s dinner and an overnight stay. There is no need to have to do anything at all on a gulet cruise and the oldies can merely unwind on the deck and be waited on but if they tumble into a a bit sprightlier class, then Grandma and Granddad can leap into the Mediterranean from their gulet and take pleasure in some water-sports activities as effectively! Read More….